A new international banking scam has touched life in the Scottish Highlands as victims were told that a chemist's shop in Thurso was the headquarters of an international bank. Taking its name from the Norse for Thor's River, the remote town of Thurso in the north of Scotland is steeped in Viking history. It is just 20 miles from the northeastern tip of the British mainland, John O' Groats, and has gained a reputation as one of the world's top surfing spots. It is not known as a financial centre, which is why it comes as some surprise that Thurso is embroiled in an international banking scam. The Northern Constabulary is investigating whether the Continental Trust Bank, which claims to be based in the Highland town, has duped investors out of hundreds of thousands of pounds. In a bizarre twist, police have tracked down the company's headquarters to a local chemist called Sutherlands, the BBC Radio 4's Today programme has learned. At first sight, the Continental Trust Bank (CTB), which also goes under the name Continental Trust Brokers, looks impressive. It claims to be one of the biggest private banks in Britain with assets of more than £30bn ($50bn) and over 70,000 clients worldwide. The bank boasts of affiliate branches in Asia, America and various offshore countries. The giveaway is that instead of basing itself in London or Frankfurt, it has chosen the Highlands of Scotland. Despite this unlikely HQ, the scam has taken in investors from as far afield as New Zealand, Norway, and the US. One of its victims is Arlen Hughes from Saratoga in the US state of Wyoming. He told BBC Radio 4's Today programme that it all started when he received a phone call, "from a fellow in Nigeria, saying I had inherited an oil company and everything that went along with it." They told him he would inherit $42m, the value of the company, if he paid some money up front. The Nigerian fraudsters said that as a non-resident, he had to pay $57,000 in tax into a CTB bank account in Scotland to release the millions. Initially sceptical, Hughes said the lure of the money and the professionalism of the fraudsters took him in: "I found a registered number in Scotland and more research led me to believe that the bank was on the uppity up. So when I began to deal with them I thought they were legitimate." Hughes and his friends, who he encouraged to invest in the scheme, were duped out of around $145,000. CTB's web site lists its headquarters at 9 Trail Street - presumably a misspelling of Thurso's main drag, Traill Street. 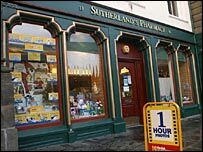 Detective Superintendent Gordon Urquhart from the Northern Constabulary, who is investigating the case, has tracked down the address to Sutherlands the chemist. Mr Urquhart says Sutherlands "has no connection to CTB, and the telephone number is merely a conduit of a number which puts you onto another number which we think is in London." Some of the bank's customers have even made the trip to Thurso, much to the bemusement of the Andrew Paterson, the manager of Sutherlands. He told the BBC, "We had a Mediterranean couple come in and ask if we were a bank. I said we weren't and suggested they go to the police. They seemed a bit upset about this." When the BBC contacted CTB to see if it could open up an account there, the bank did not respond, though it did say it had moved its headquarters from Thurso to Dumbarton, on the west coast of Scotland. Records at Companies House reveal that the accounts of CTB. Limited, also based at 9 Traill Street (this time spelt correctly) are over eight months overdue and the business has been dissolved. The BBC was unable to contact the directors of CTB to establish whether it is linked to the Continental Trust Bank or Continental Trust Brokers. The scam is one of many so-called 'advanced fee frauds' operating around the world, such as the Nigerian oil company fraud and the Canadian lottery scam. Steven Philippsohn, a fraud expert at Philippsohn Crawfords Berwald, says the Scottish banking scam is a perfect example of a fraud which is very much on the increase. "In all these cases victims are convinced that one way or another they are entitled to a sum of money which they will receive on payment of a courier fee or something similar. Once that payment is made they will be asked for more money until they eventually realise the fraud, or run out of cash," he told the BBC.